Completion of the Engineering 2 Building this summer has added 150,000 square feet of new office, laboratory, and classroom space on campus, primarily for the Baskin School of Engineering. The project also includes the new Jack Baskin Engineering Auditorium, a 212-seat lecture hall. 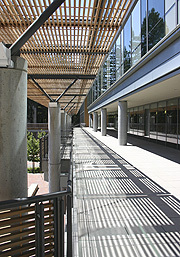 A large open plaza provides an inviting outdoor space between the Baskin Engineering Building and Engineering 2. Engineering Dean Steve Kang said the new building provides a much-needed expansion of facilities for the School of Engineering. "Faculty, graduate students, researchers, and staff have had to bear with constant rearrangement of offices and sharing of laboratories for many years. Finally, Engineering 2 provides quality spaces for further development of research programs and adequate space for our staff organizations," Kang said. The Department of Economics has also moved into the new building, occupying about 75 percent of the fourth floor. Programs involving collaboration between economics and engineering, such as the Information Systems and Technology Management (ISTM) program, will benefit from this arrangement, Kang said. "Having the Economics Department in Engineering 2 along with the ISTM program will benefit not only research programs, but also students in both programs," he said. The top floor of the building will eventually be devoted to two California Institutes for Science and Innovation: The Institute for Quantitative Biomedical Research (QB3) and the Center for Information Technology Research in the Interest of Society (CITRIS). For now, temporary space on this floor is being used to house faculty from the Departments of Chemistry and Biochemistry and Molecular, Cell, and Developmental Biology, who have been displaced by the seismic retrofitting of the Sinsheimer Laboratories Building, combined with the delayed opening of the Physical Sciences Building. The Baskin Engineering Auditorium is a state-of-the-art facility for classes, lectures, and special events. Its features include videoconferencing capabilities. "Overall, the Engineering 2 Building, the Baskin Engineering Auditorium, and the plaza environment are a huge plus, not only for the engineering school but for the whole campus," Kang said. Engineering 2 includes two 50-seat classrooms for general assignment and a 100-seat experimental classroom for use by the CITRIS group for research on interactive learning environments and advanced display technologies. All of the classrooms are fully wired, with electrical outlets and network connections available at every seat. Patrick Mantey, Baskin Professor of Computer Engineering and campus director of CITRIS, said plans for the 100-seat classroom, called "the Simularium," include research aimed at making large classes more interactive and effective, connecting classrooms with students in remote locations (distance learning), and advanced capabilities for information display, computer graphics, and scientific visualization. Technological innovations that will be explored in the Simularium include a variety of large-screen display capabilities, support for the use of displays by members of the class or audience, and capture of displayed material to an individual's computer. This high-tech classroom and two smaller laboratories in the building will be used to advance and showcase CITRIS research on the use of technology in education, Mantey said. "The Simularium will offer a unique interactive learning and presentation laboratory and, it is hoped, attract support and sponsorship from industry," Mantey said. Facilities for QB3 in Engineering 2 include a specially designed computer room that will house a powerful new cluster of computers for bioinformatics research and work in computer visualization in conjunction with CITRIS. David Haussler, professor of biomolecular engineering and campus director of QB3, said the new computer room will complement his group's "Kilocluster," a 1024-processor array housed in the Baskin Engineering Building. "The Engineering 2 Building gives us much-needed space for new faculty, staff, students, and postdoctoral researchers," Haussler said.